Matches are necessary for many different purposes. You might use a match, for example, when you’re on a camping trip and you need to start a fire. Or, you might use a match to light a cigarette or a candle. Whatever the case may be, it makes sense that, before you buy matches, you would want to be aware of the best strike anywhere matches available.If that’s the case, then you’re in luck. Here, we’ve got all the information you need to choose the very best matches for your particular purposes. As you read through our information on strike anywhere matches, you may find yourself wondering how exactly we chose our ratings and how we decided which of the matches currently on the market are the very best. While there’s not a simple answer to that question- we actually do a lot of different things to arrive at our ratings- rest assured that quality, honesty, and accuracy matter just as much to us as they do to you, the consumer. We make every effort to scour through real testimonials and unbiased consumer reviews. We also compile researched data about the products we discuss, consider the reputation and longevity of the brand, and then use all of this information to arrive at what we honestly think, based on all our “digging,” are the best brands on the market. 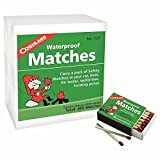 So, if you are looking for a real, unbiased opinion about strike anywhere matches and which ones you should buy, you’ve come to the right place. We like these matches, which can be somewhat hard to find, because they truly do work on just about any surface. So many “strike anywhere” matches don’t live up to their name and will only light when used with their box…if they even work then. However, UCO matches will light on the box, on brick, and even on wood and rock, a fact that will make camping enthusiasts especially happy. If you’ve ever bought matches before, then you have probably heard of the Diamond brand. It is, after all, one of the biggest names in the industry. It’s also one that has been around for a very long time- since 1864. We appreciate these matches not just for the long-known brand but also for the fact that they work most of the time. You might get a dud every now and then, but, all in all, there is a major reason that the Diamond brand has had such longevity. We had a hard time determining if these matches really deserved third place- they did, after all, have a hard time striking in some cases. However, we do appreciate the fact that these matches are well made, affordable, and can always be counted on to light when struck against the box. However, with that said, results weren’t great when attempting to strike elsewhere, which is what earns this matches brand its middle of the road score. These aren’t horrible matches, despite the rating that we are giving them. In fact, they work most of the time and on many surfaces. The only problem is that these matches tend to be quite thin and brittle, making them prone to breaking. So, basically, they’re good and will light…as long as you can keep them from breaking, which is a more challenging and frustrating feat than it should be. These matches are very well made, but they’re so “safe” that they can be very hard to light. Even on the box, they were tough to light, which earns them our lowest rating of the bunch. As you can see, some matches are definitely better than others. Fortunately, you now know which brands are among the best choices you can make. Whether you go with one of these brands or not, simply look for matches that are well made, thick enough to not break easily, and that can easily be lit anywhere you deign to light them. If you can keep these qualities in mind, you can end up with truly great matches no matter what your needs or purposes. Hopefully, now you have an understanding of how to choose strike anywhere matches and which brands are the best to buy. With that said, though, it is important to clarify on a common point of confusion. Many people who are looking for strike anywhere matches end up accidentally buying “safety matches.” In fact, many of the same brands that make strike anywhere matches also make safety matches, thus adding to the confusion. As a consumer, it is important for you to understand that these products are not one and the same, nor are they interchangeable. Safety matches, while they might look the same as strike anywhere matches, are designed, as the name implies, with safety in mind. This means that they will not strike on any surface of your choosing, nor are they designed to. Instead, these matches are specifically designed to strike only a specific striking surface. This surface may be separate and included, or it may simply be a designated area on the box. 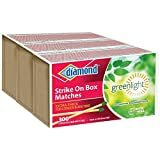 When this is the case, you may also see safety matches labeled as “strike on box” matches. It is important to note that safety matches are a lot more common and much easier to find than strike anywhere matches. Thus, if a particular box of matches does not specify which category it falls into, you can assume that it more than likely falls into the safety matches category. With that in mind, never assume that matches are of the “strike anywhere” variety unless they specifically say so. As you may have gathered from the above information, strike anywhere matches can be harder to find than safety matches. If you are having a hard time finding strike anywhere matches, then don’t worry. You can easily order them online, or, if you prefer to shop in person, most camping and outdoors stores will have them. The bottom line is that, if you want to find them, you should be able to, though it can sometimes take a little work. These are harder to find not because they don’t work well (they do), but because manufacturers don’t want them to too easily get into the hands of children or others to whom they might pose a danger. As mentioned, strike anywhere matches are a lot easier to use than safety matches. For this reason, you’ll want to be very careful to use these matches safely. Obviously, you want to keep them out of the hands of children. Place matches on a high shelf, in a locked box, or somewhere else where curious children will not be able to find them. Furthermore, educate the children in your life on the risks associated with both matches and fire. If they know the danger, they are less likely to do something that could harm themselves or others. While you should do everything possible to guard against the possibility of an unintentional fire due to misuse of strike anywhere matches, you should always plan for the worst, just in case. Have an escape plan for any building that you frequent. In other words, know how you would get out if a fire did start. Also, take advantage of devices that could help you in the event of a fire, such as fire sprinklers, fire extinguishers, and smoke alarms. The more of these you have at your disposal, the greater your chance of escaping a fire without serious personal or property damage. In addition to taking these cautionary measures, keep in mind that it’s not just children who need to be careful when using matches. Even adults who have experience with matches can still make mistakes. For that reason, always use your matches properly and with care. For example, you should always strike a match away from the body and in a direction that will cause the flame to light away from the body. This is especially important if you are wearing clothing that is more flammable than most, which you should avoid if possible. Make sure you focus your full attention on lighting the match. While this might be something that you have done a thousand times before, it only takes one time to end up making a huge and damaging mistake. As such, don’t light a match when you’re distracted. Give the task your full attention. It only takes a second, but it can make a world of difference. Remember, too, that you should never light your matches near or with the aid of gasoline or other flammable substances or liquids. This could easily lead to a fire or an explosion, so be careful. Know what is around you before you light that match. In addition to striking matches with care, extinguish them with care as well. Blow out the flame when done and wait for the smoke to die down. The match should be cool to the touch when you throw it away. Stay by the trash can for a few minutes after disposing of the match just to ensure that a fire does not start. As you can see, a lot can go wrong with matches if you are not careful. For this reason, the utmost care and caution are completely necessary when using matches, especially strike anywhere matches. Many people like to get a stockpile of strike anywhere matches. That way, they will always have them on hand when needed, especially in the event of an emergency. This is a smart idea, but remember that matches need to be stored properly if you want them to work when you need them. Something major to keep in mind when it comes to storing matches is that you do not want them to get wet. If matches get wet, they will not work. Even after they dry, they typically do not work, at least not as fully or correctly as they are supposed to. Thus, take care to store your matches in a dry place, preferably not outdoors. If you plan on storing matches for longer than a few months, it is also a good idea to keep them in some kind of plastic case. This will protect them from air, shifts in temperature, and other factors that could potentially affect their quality and functionality. You should also be sure not to store your matches near flammable substances, such as gasoline, or near aerosol cans. While it is unlikely that some kind of accident or explosion would occur, you never know, and it’s better to be safe than sorry. Remember, too, that matches should always be stored in a place where they cannot easily be accessed by children, the impaired, or anyone else for whom they might potentially pose a danger. As you can see, there is a lot to know about strike anywhere matches, probably more than you ever thought possible. However, the more you know about these matches, the better off you will be. Hopefully, you now know what strike anywhere matches are, what the best brands available are, and how to both use and store them safely. For any other questions or concerns, consult a reliable source online or ask a professional. After all, knowledge can only help you when it comes to matches.